MyPublicWiFi for Windows 7 - A program for organizing an access point using the capabilities of a wireless network card. The application supports encryption using the WPA protocol, allows you to set the name and password of the future network, includes a tool for monitoring active connections and the possibility of mac or ip filtering. The utility allows you to restrict the use of p2p connections and specified addresses, can log the resources that are opened by url, and load when the operating system starts. The program has a simple user interface and is compatible with most modern network cards. 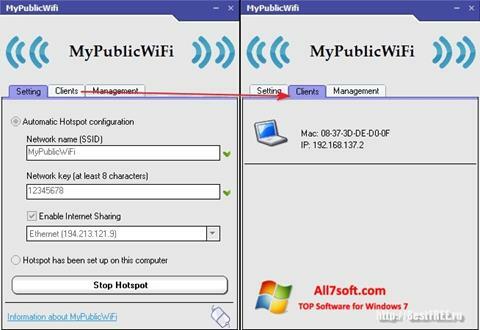 You can free download MyPublicWiFi official latest version for Windows 7 in English.